WOLF HEAVY DUTY STEEL WHEEL IN BLACK 16" x 6.5"
Wolf Heavy Duty Vented Steel Road Wheel. 16&apos; x 6.5&apos;, 2-3/4 offset. These are the famed Wolf Wheels, first fitted by Land Rover to British Military Defender TUL 90s and TUM 110s known as &apos;Wolfs&apos;. These are the strongest wheel known for Land Rover. Thicker than normal steel road wheels they are designed to fit hub assemblies used on Defender from 1994 onwards. This longer wheel stud / hub assembly can be identified by a straight line stamped into the outside head of the wheel stud. This stamped line resembles a straight slot for a standard screwdriver and is easily viewed from the outside of the vehicle. Unfortunately it is the hub assembly that allows the stud to appear longer. So simply replacing the studs will not give you the extra length desired. The difference is 2.5 threads. 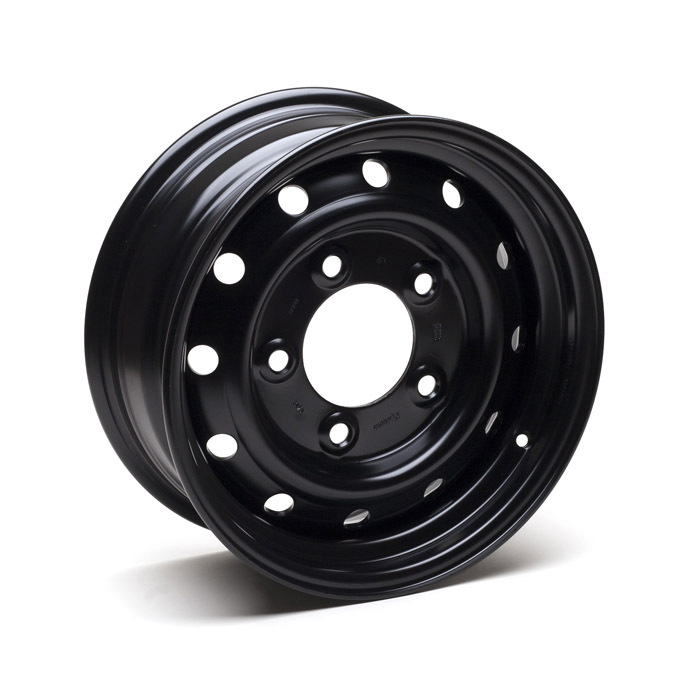 The Wolf Heavy Duty wheel can be bolted to early Defender and Series III fitted with original slightly shorter studs without any safety issues. Your wheel nut will be 2.5 threads from fully flush with the top of the stud. These wheels should not be fitted to Series II, or IIA as their original wheel studs and nuts are too undersized for these wheels.